Step inside the Royal Palace a full hour before the general public for a guided tour of the opulent interior. This palace, which is still used for ceremonies throughout the year, is Spain’s answer to Versailles and it’s just as impressive, including lavish decorations and works of art by the Spanish masters. Next, stroll through the Barrio de la Morería to learn about Madrid’s Islamic past, then enter the famous Mercado de la Cebada for your second highlight of the morning: tastings of wine, cheese, olive oil, and the world-famous iberian ham at our favorite food stall. After your tastings, explore the medieval streets of central Madrid as you learn about the history and culture of the city, stopping off at the beautiful Plaza Mayor, and the vibrant Puerta del Sol. Then, for a better view of the area, head up to an exclusive rooftop terrace for panoramic views of the city. After a break for lunch (not included), you’ll reconvene for a walk down Madrid’s most famous avenue, the monumental Paseo del Prado. 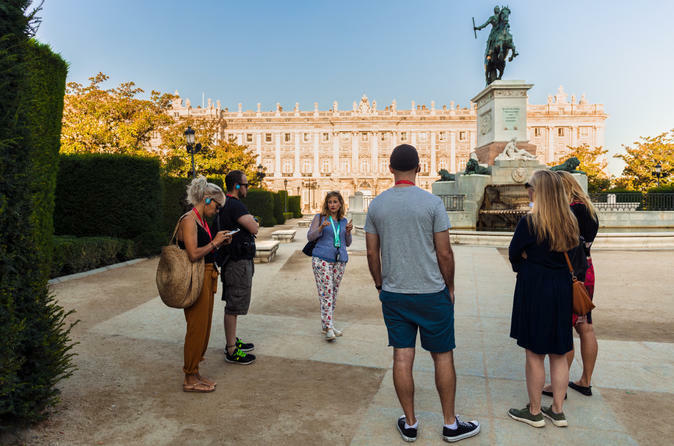 Stop off at iconic monuments like Cibeles Plaza, the Fountains of Neptune and Apollo, and the Banco de España as you learn about the ways that the Bourbon dynasty beautified the city with jaw-dropping architecture. Finish with skip the line tickets at the Prado Museum where you’ll see the highlights of the world-famous collection, including works by Goya, El Greco, Bosch, Tintoretto and more. The star of the collection is Velazquez’s “Las Meninas”, a work that is as famous as it is mysterious. Your expert guide will explain the story behind the painting and why it continues to frustrate and enchant art lovers. When your visit ends, you’ll be free to continue exploring the museum or get some recommendations for what to see, do and eat from your guide and head off, content that you have seen the best of Madrid in a single day.